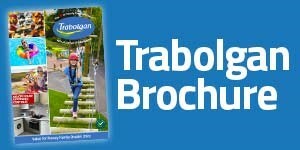 Trabolgan has an exciting range of activities for young and old, so make sure you don’t miss out! Admission Fee is payable on entrance to Trabolgan and prebooking for Day Visits is not essential however some activities including TAS adventure sports may require pre-booking in advance of arrival. NB- All Children under the age of 14 years old must be accompanied by a responsible adult, over the age of 18, when attending our Pool. The adult must remain in the pool in constant supervisiion of children 10 years and under. The adult must remain on the pool deck supervising children from 11-13 years of age. These activities are located in and around the Sports Hall area and an additional cost applies. Tickets can be purchased at the Sports Hall Coffee Shop. NB- All TAS activities are subject to availability & weather conditions. Please Note limited activities on Mondays or Fridays on check in days or Tuesdays and Friday on bank holidays- Trabolgan Adventure Sports varies on a daily basis. Minimum numbers may be required to run certain activities. Age and height restrictions apply. Prebooking may be required. Please visit the sports hall information or call in advance on 021 4661551 to check availability or book activities. Located across from our information point/gift shop and our outdoor playareas, Florrie's Fun Crazy Golf offers 9 fun and challenging holes for all the family to enjoy. Located at the clubhouse on our golf course be sure to visit our Bird of Prey Educational Centre where you will see Hawks, Falcons and Owls. Your day visitor ticket can be used an one of your options for entry to the Bird of Prey Centre. Seperate entrance fee of €4 per person & €12 for a family of 4 applies to enrance to the Bird of Prey Centre if you redeem your day visitor ticket for another activity (subject to opening dates and times). During special event weekends/weeks activities will run on a limited basis with no entertainment on these dates. *All day visits subject to Trabolgan terms and conditions. Please note pets are not permitted on park except for guide or assistant dogs.